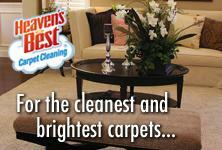 Are you looking for Carpet Cleaning Services in Birmingham, AL? Look no further. Since 1983, Heaven’s Best Carpet Cleaning has been providing home and business owners with exceptional carpet cleaning services throughout the U.S. Heaven’s Best is now open in the Birmingham, Alabama metro area. We don't just clean carpets either! We are your complete solution for carpet cleaning, hardwood floor cleaning, upholstery cleaning, and tile and grout cleaning. Our technicians are IICRC (Institute of Inspection, Cleaning and Restoration Certification) trained to deliver top-quality service at an excellent value. We offer a low moisture carpet cleaning process that dries in 1 hour. Our solutions are green and eco-friendly, so they are safe for kids, pets, and the elderly. We use the most current and advanced cleaning technologies on the market. Our equipment is state-of-the-art and performs exceptionally well. We have many different cleaning solutions that will get out most any spot or stain you may have. Our cleaning solutions will thoroughly clean your carpet and floors and they smell great as well. Our prices are very competitive, so you will get a great value for your money. When you call Heaven’s Best to have your floors cleaned, you will get an honest price and an exceptional cleaning service. We clean both residential and commercial floors. We offer some of the best rates in Birmingham for cleaning your office or business carpets and floors. If you need carpet or floor cleaning services in Birmingham AL, call Heaven’s Best Carpet and Upholstery Cleaning today at (205) 618-9150.